This chapter describes ways to analyze the data you see when viewing a pivot table in the Analyzer. Also see “Accessing the Samples Shown in This Book,” in the first chapter. 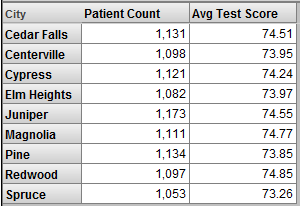 A detail listing displays fields at the lowest level, for the records associated with one or more selected cells. You can display a default listing, select a different listing to display, or even select the fields to display. You can also sort the detail listing. The following subsections provide the details and also describe how to exit the listing. If you display a listing and save the pivot table, the Analyzer saves its listing state. That is, when you next open it, the Analyzer redisplays the pivot table as a listing. Similarly, if it is included in any dashboards, it is displayed there as a listing. Display a pivot table as usual. 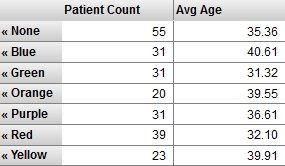 Click the data cells in the row or rows. To select multiple cells, hold the Shift key down while clicking the cells. To select an entire row, click the row label on the left. To click an entire column, click the column header. The listing option is not available for cells in a total row or a total column. Click the Listing button . If there are more than 100 rows, the bottom area displays buttons that you can use to page through all the rows. The Pivot Builder area now displays the Custom Listing Fields box, which is for use when you select fields to display, if possible. Display the default listing as described earlier. Select Detail Listings in the Model Contents area. Click the name of the listing to display. Typically each listing uses a different set of fields and is meant for a different purpose. If the name of a listing is italicized, that indicates that this listing is defined in a listing group and that you have the necessary permissions to modify the listing. See “Defining Listing Groups” in Defining Models for InterSystems Business Intelligence. Click the Pivot Options button . Select a listing from the Listing drop-down menu. The system then displays a listing that initially shows only the IDs of the records. Optionally clear the Auto-execute check box. This is helpful if the listing uses many records, because each time when you change the listing definition, the system reruns the corresponding query by default. When Auto-execute is off, the system does not rerun the query automatically. This folder lists the available listing fields in this subject area. 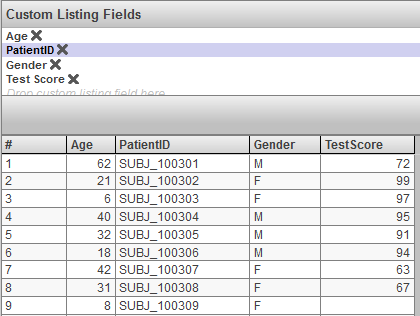 Note that the sample Patients cube defines a listing named Custom listing. This listing is an ordinary listing defined with custom syntax and cannot be used as described here. Drag listing fields from this area to the Custom Listing Fields box. If you cleared the Auto-execute check box, use the Refresh button in the Pivot Builder area. By default, the definition of a listing controls the order of the rows. You can instead sort the listing by the values shown in any data column. To do so, double-click the column header. The first time you double-click the column header, the listing is sorted in ascending order, by the values in that column, and the column header includes the >> characters to indicate this sorting. If you double-click the column header again, the listing is sorted in descending order instead (and the column header includes the << characters). If you double-click a third time, the sorting is removed and the default order is restored. In some cases, you can drill down by double-clicking a row (other than a total row). In some of these cases, the system uses the hierarchy, if any, to determine how to drill down. In other cases, the system drills down in a custom manner, as defined in the pivot table. 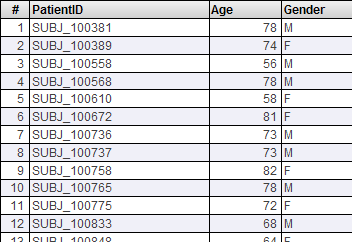 The drilldown action has no effect if the pivot table uses a manually entered MDX query. See “Specifying the MDX Query Manually,” earlier in this book. To customize how the system drills down, see “Customizing Double-Click Drilldown” earlier in this book. This section provides a demonstration. If we double-click again, nothing further happens. If you drill down in a pivot table and then save it, the Analyzer saves its drilldown state. That is, when you next open it, the Analyzer redisplays the pivot table with the drilldown. Similarly, if the pivot table is included in any dashboards, they display it in its drilldown state. Click the left arrow button in the toolbar. Click the X button in the Drill down area in the toolbar, if applicable. Click the << arrows in any of the rows in the pivot table. In the drilldown action, you focus on a row in the pivot table and see a different breakout for that row. To drill down in an arbitrary way, drag and drop any level from the Model Contents pane onto the non-scrolling part of a row in the pivot table. This option is not available for a total row. Also see “Saving the Drilldown State” and “Clearing the Drilldown State,” earlier in this chapter. The analysis option is not available for cells in a total row or a total column. Click the Analysis button .